When I first look at it, I think "would you still have taken it even if it was Mr Zegna?". Then I look more closely – at the jacket, shirt and the tie especially, and I think "yes, definitely". It's something I'm becoming more and more interested in – how much do our clothes and style define who we are and what we do, and vice versa how much does what we do define how we dress? It's probably all interlinked. The suit seems to have a subtle print in it…very cool. Like the slicked back hair too. I Love his suits! Great style!! Zegna makes beautiful clothes. Their fabric is simply divine! I do agree about the fact that maybe you wouldn't have taken this picture if it wasn't Zegna… I mean you'd obviously expect someone with that name to be dressed correctly. I mean, I get it, the shirt length is perfect, the collar is fantastic but isn't that something he has to do bu a rule of thumb? I do like the wedding band he's wearing, very nice and inderstated. He's always so sharply dressed…such a good style role model. Happy man in tune with the present! Refreshing to see some restraint and propriety, as old fashioned as that may sound. He does have a great smile and I think he could get by on that alone if he wanted to! very classic and handsome . love his genuine smile . I own a lot of Zegna stuff. 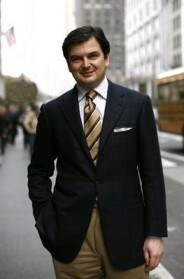 As exemplified by this picture, the clothes are ususally subtle, tasteful, and timeless (ditto for Luciano Barbera). The quality of your clothes should be the announcement that is made when you walk into a room. I love the navy silk knit tie. His lightweight summer fabrics are amazing, be sure to grab a suit. Great suit and lovely tones in the blue. Pure classic elegance – nowadays this is not so common… simple and very welcome delight. As I get older (44 next spring!) I truly admire looks like this. The Devil is in the Details. Great suit, shirt and tie and even the raincoat works. The fit is perfect – he's showing 'some cuff' as JFK used to say. What's noteworthy is how comfortable he looks. I've come to believe there's two types of dressers: those who reveal themselves via their choices; and those who try and become different people through their clothes. Neither is better than the other. But I am definitely moving from latter to former. This photo is of a man who looks comfortable in his own skin. Because he's got that right – the clothes are an extension. Excellent, understated, relaxed and yet authoritative too. Great suit fabrication. love the button as well. I am curious about the tie – is this knit (or is it just my monitor bitmapping the image?)….thanks! Simplicity makes no effort to it's style! Couldn't get this one but the jacket sits nicely. Great shot – clearly the Zegna empire is thriving – or at least the economic times aren't stressing him out as he hasn't aged/changed much at all in the last several years… this photo could have been taken yesterday or 15 years ago (also a testament to classic and timeless style). When I see this smart man's smile I just thought that wearing great clothes is just a good therapy : relaxing and smiling ! He has the right amount of calculation of choice here. Exactly what I like in a well-dressed gentleman. wouldn't you be soo pleasantly suprised to be seated next to him on an overseas flight? you know you'd have nice conversation and politeness to no end. a welcome luxury. My husband wore a Zegna tie to our wedding. Great brand. Good quality menswear. He actually looks like a friendly man. Beautiful suit, appears to be silk or silk-wool blend with nice drape and perfect fit, of course, considering it's Zegna and must be made for him. I would prefer more contrasting tie. His personality is apparent, no? I just became a future customer. How an adult male in a business environment dresses. Such a distinguished gentleman! I love it! Funny that this is in Italy, as it looks like an American "sack suit"! It looks comfy( in the neck and waist), yet well done (sleeve length). 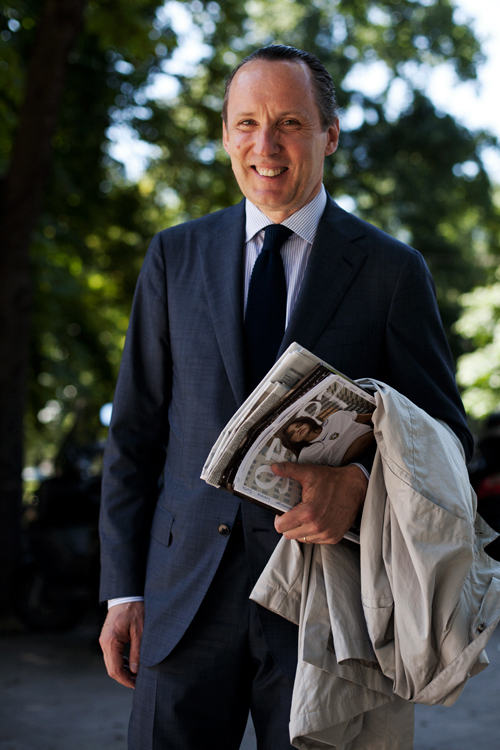 My husband, whom I turned onto your blog months ago, came home Tuesday night and the first thing he said was "Mr. Zegna" was featured in The Sartorialist. He loves the clothing, especially his shirts, and would have passed out on the street if he'd seen him. I love the Zegna shirts hanging in my husbands closet. Sometimes I go in there just to touch them and look at all the different window pane plaids and such, so lovely! Didn't even notice the clothes – this is a smile that makes you smile back! I'm STILL smiling. I love the knitted tie, simply beautiful. I love him for the beautiful fabrics and construction of his clothes. "How does he make cotton feel like silk," I ask? I cannot believe the comments about Scott not taking this photo if it hadn't been Zegna! He looks a bit mussed, but most likely has been working for twenty hours straight or perhaps just got off a plane or train after traveling all night. Maybe I have a vivid imagination, but I'll bet I'm correct. And the photograph is "totally" worth posting. His suit, shirt and tie are of the finest fabrics and besides this, he has a million dollar smile. Its a great photograph. I swear, people can be so catty! I am using Ermenegildo Zegna business card holder. 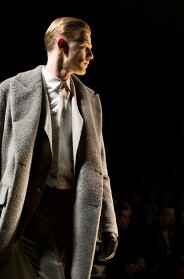 Ermenegildo Zegna is also best in luxury men’s formal, shoes, leather bags, perfumes and eyewear.